Here are a few pics of goings on at Beaton’s over the past few months. Spring has long sprung with the usual bustle at Beaton’s. The docks are getting full and the average water levels have reached ideal Sjogin conditions. Serena, the Joel White Flatfish and the A-Cat Lightning looking Beaton Fresh. Serena was built at Beaton’s a while ago. She’s a sistership to Charlotte, built by them in 2003. The building mold is in the yard and ready to go. They’re great daysailers with shallow draft. Give Tom a call. The rebuilt foot of a very large catboat mast. This one will live again thanks to the attention of Paul Smith. At the other end of the mast work at Beaton’s scale is Speedwell’s new mast foot. I had Paul remake the foot to match the existing Duckboat mast step. With the limited bury it will make the rig more secure. It had a round foot that would allow the mast to rotate as spritsail did. This may give me a chance to setting up the sail as a lug. We’ll see. New decking in front of the South Shed whose East wall still bears the sctatches and dings from Sandy. Our community will have them for a long time. 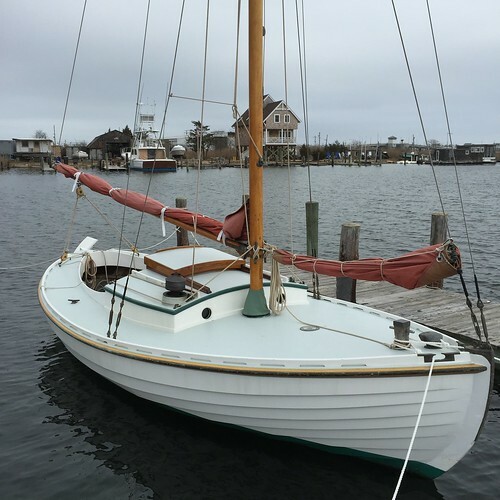 Once again WoodenBoat has seen fit to have me write an article for them. 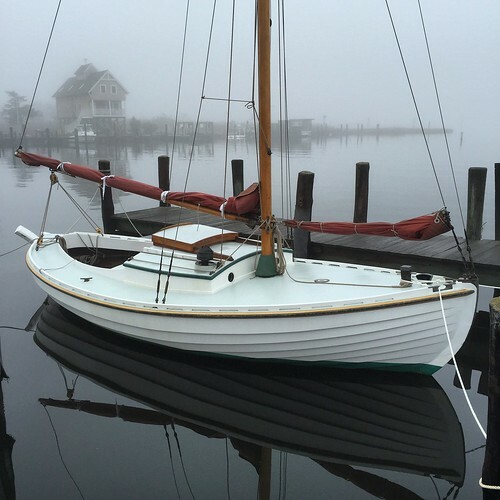 It’s in the May/June 2018 issue of WoodenBoat Magazine and tells the story of a boat that once again graces the waters of upper Barnegat Bay. There’s also a sidebar celebrating 54 years of Paul’s work at Beaton’s. And here’s a video taken a few weeks ago just as the marsh was starting to green up. If you keep you focus narrow it’s easy to imagine what it was like a few hundred years ago. Hove to of course. 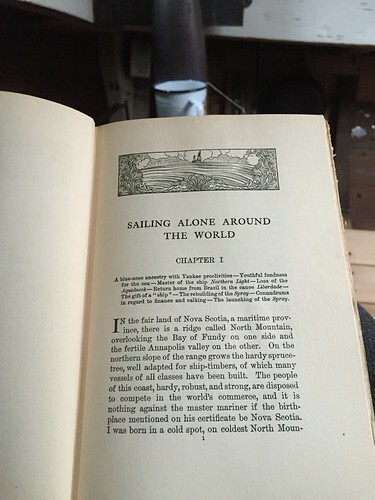 Author RussPosted on May 30, 2018 June 9, 2018 Categories Beaton's, On the Bay, SjoginLeave a comment on Beaton bits and a sailing video. And the first sail of this year and the bright, new Spring we are supposed to be having. Too dry and cold so far and little water in the Bay. Last snow of the year on deck. It makes the warmth from the stove just that much better. View from the spar shed. Nice spot protected from the northeast. There’s a greater chance of icing over in here but the protection’s worth it. (and little persistent ice this past Winter. Calm day waiting for water and a breeze. Please excuse the temporary blue tape mast boot. Better system on its way. New tiller from Paul Smith. It’ll weather for a bit and then be finished bright. Another breathless day at Beaton’s. It never gets old. Ready to go for the first sail of the New Year and Spring. It’s always a thrill to go for that first one after a lay-up. 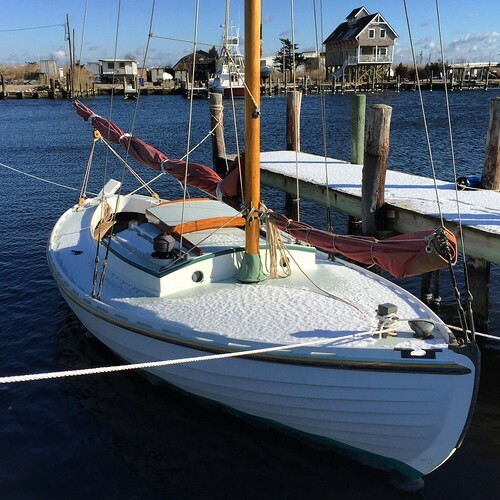 Thanks to Paul and the folks at Beaton’s Sjogin’s ready for another season on Barnegat Bay. Hove to off Swan Point once more. Sjogin hasn’t forgotten how. Your Happy Skipper under way. The new tiller allows sitting on the seats when driving. Most comfortable. Back at the dock after two missed attempts; one too fast and one to slow. The last one was just right. Need practice. A fine draw with the raised smoke head with far fewer puff backs. Sjogin’s nod to the Modern Age. New Solar panel keeps the battery topped up. When on board it slips under the seat with no visible wires. Then its back to the 19th Century. 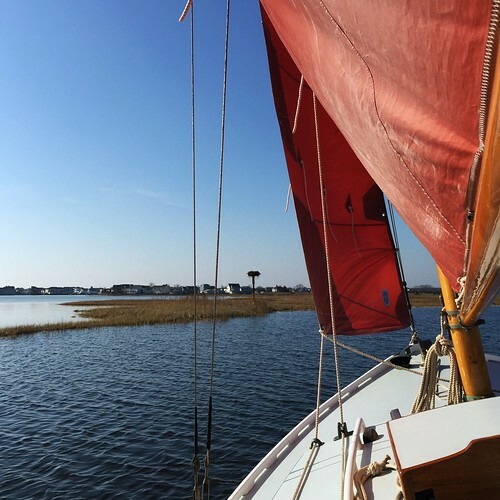 Recent read down below about sailing a 22′ Catboat sans engine in one of the finest but challenging cruising grounds anywhere. Mr. Cheney (not that one) and I have a similar sailing philosophy. He too sails slow. Bosun’s work: making a strop to be used as the jib tack. Note the new bronze snap from the extensive legacy of a local legend. RIP Bad Bob. New sounding lead salvaged by Paul. It works far better than a two inch square nut. Well, here we are after another pause. The above pics had their captions removed and order changed with a dumb click on my part so you may find new details and a changed pic. Trust some still enjoy this format. I seem to treat it as a monthly than as a more frequently updated Blog. Busy Winter in the wood shop. 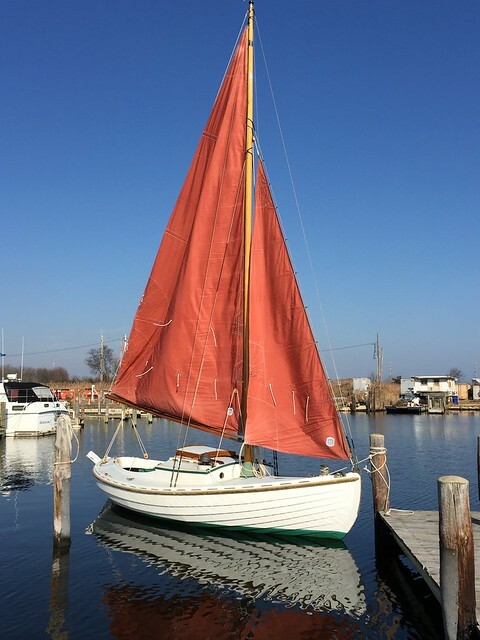 After Sjogin’s recent refit, the Hankins’ skiff Legend was brought in for the same treatment. There’s also the elegant rowing skiff awaitng return of the principals to salt water to continue her re-construction. If you have a project, I’m sure Beaton’s could fit you in. New tiller for Sjogin by Paul Smith. Bespoke indeed. And a proper sounding lead for Sjogin from the collection of a local legend. Thanks Bob. Here’s Paul tending to last seasons wear and tear on Myth bits. Here’s Paul with Sjogin’s new/old boat hook. The natural Swamp Maple crook was carved by Phil Clarke in the 1970s. Long enough to sound my way around Barnegat Bay. No bottom, no problem. Steaming cedar planks for the new rowing skiff. The seemingly eternal search for fair enough. Look familiar? It’s the job made form used to set the curve in Sjogin’s coaming. Dave explaining the virtues of the new, larger bilge pump. The new skiff . Plenty of twist forward. So this was fairly easy. Sjogin stuff soon. If, for some reason you come here just for a glimpse of a beautiful boat and reasonably taken snaps of our particular place of Earth, then I’ll not disappoint. I’ve been at this now for more than a decade, reaching folks all over our watery world and now ask for your indulgence if one of the pics below makes reference to current events. First up is one of Sjogin through a Prisma algorithm. Given the right photo, the painterly effect works well. A very shiny Lighting. Nice off season work. Here’s another Prisma example. Some of the algorithms work better than others. I think this one is called Dallas. Finally, here is one taken at noon on Election Day. After the tumult of the past year or so, a quiet sail before voting seemed necessary. Will we need to find a term to describe the time before that day and the time after? I hope not. Patience, good will and manners will see us through to remembering this past Election Day as just another one, a bit of a Black Swan, but none the less one of many more to come. Your considered comments are welcome. “Wiggle it some more so I can find the pin.” Duck boat frenzy the week of the Worlds. Looking Beaton Fresh and ready for her close up. So it’s as easy as just tapping the pics on your device and here we are. I see that once again I’ve managed to allow another month to go by without a Post. But then again here I am with another month’s sailing and having watches below at the dock under my belt. And a straining belt due to said watches below with sausage bread. Anyway, here are a few recent A-Cat pics as the first races are but four quick weeks away. 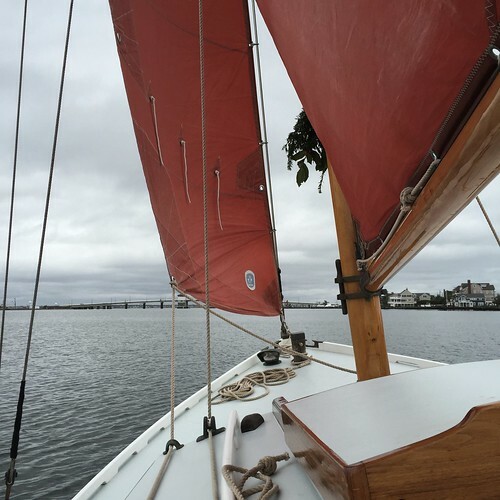 And a video to close of a very quiet sail last Saturday, May 14. Surprisingly few boats out. Raven and Lightning ready for another Season and looking Beaton Fresh. First race is on June 25th. Hope to be back in the water by then after a fresh coat of bottom paint and such. Myth sporting her Summer Cabin and a very yellow Vapor. Vapor’s mast getting ready for raising. Another fine varnish job by Paul Smith. Beaton Fresh indeed. Your very happy Skipper out on a beautiful Saturday morning in the middle of a too cool May. Here are some pics from the last few months, especially Beaton’s pics. A sure sign of Spring: the Garvey afloat and ready for another season. Homage to Jay Fleming. A very quiet morning last month. A quarter Century ago. Fitting the step scarf on Ghost’s coaming/cabin joint. Note my initials on the cork sanding block. Valuable item. Photo courtesy of W. F.
Even the half hull models get a fresh paint job. 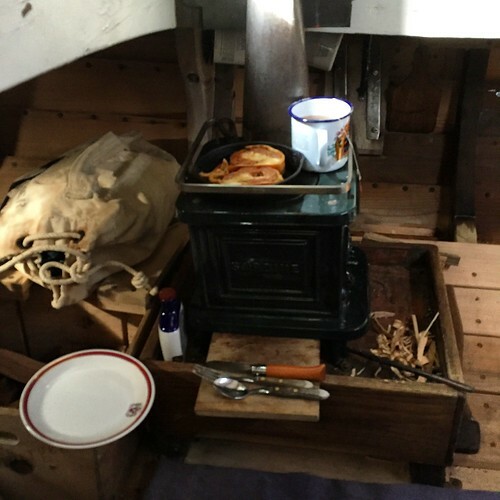 Healthy draw from the stove on the Starboard tack. This is a big plus. Extending the bulkhead to the keel helps keep a positive flow. More to come but I just realized it’s been a month since my last Post. Not much new, just the everyday joys of being able to go “check on the boat” and maybe squeeze in a quick sail or a watch below. Happy Spring all. You may have noticed in past pics Sjogin’s rudder is always canted over one way or the other. That was due to a combination of buoyancy in the immersed plywood blade and the weight of the rudder cheeks forward of the pivot line. The solution added about ten pounds of lead the the aft edge of the rudder to allow the rudder to sit upright. Paul drilled five two inch holes in the plywood and filled them with epoxy and lead buck shot. In one of the photos below they look like caviar. Worked just as guesstimated. It could use a few pounds more as the tiller weight still holds it over at extreme angles. Works fine enough for now. I expect to pull Sjogin for a quick refit soon. She’s not been out of the water since re-launching in September, 2104 except before her star turn last August. You can see how the rudder wants to float on its side. Now fixed. Looks like fresh Beluga. Maybe one more hole filled with lead when she’s hauled. All painted up and ready to go. Jeff Reid helped with the installation. Before hanging it we let the rudder go slack on the line we attached and found it still floats. Good to know. Hanging damn near vertically. A bit more lead should do it. Sailing pics and video next. 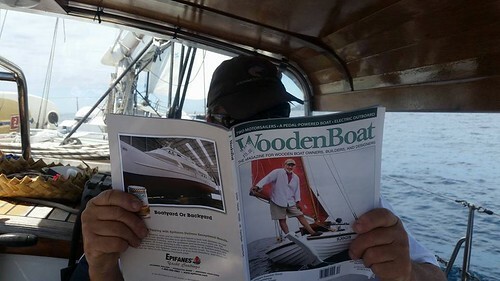 Here’s a snap from WoodenBoat Forum friend John B catching up on the latest news from Barnegat Bay. Photo taken during the family cruise up to the warmer bits of New Zealand. The joy continues. Looks quite comfortable as we gird our loins for a nasty Northeaster. Here are a few more from the last few weeks. Not surprisingly, one involves hot and crispy sausage bread. This morning with the first snow of the season. The photo taken next Monday should show quite a different scene. Thankfully no serious ice yet. Once again, at the sizzle. Which the frequency of will need to decline lest I fail to fit through the hatch. But so good; especially on days like this. Hope to have some down below after the coming storm. The current read on board. It’s been years since my last trip around with Brother Joshua. This is a 1900 second edition just scruffy enough to fit right in. It’s a long read, so this book should see me through to Spring. Finally, one more last look shot. Never get tired of it. Took advantage of a break in the weather today to get in one last sail this year. Overcast and about 50 or so with a light southeasterly. Cool enough for a fire and a sizzle. Had the Bay to myself so sitting below was no problem while actually hove to off Swan Point. Here are a few pics from today and the last few weeks. Reaching along the Mantoloking Shore this morning. Hope they all enjoyed it. Earlier this month waiting for crew. Best late fall/ early Winter sailing yet. Keep it coming. Beating up to Reedy Creek on a very warm December 10th. Close enough. The Bay was up about a foot or so and fairly clear. Clear enough to get within inches of the marsh edge. 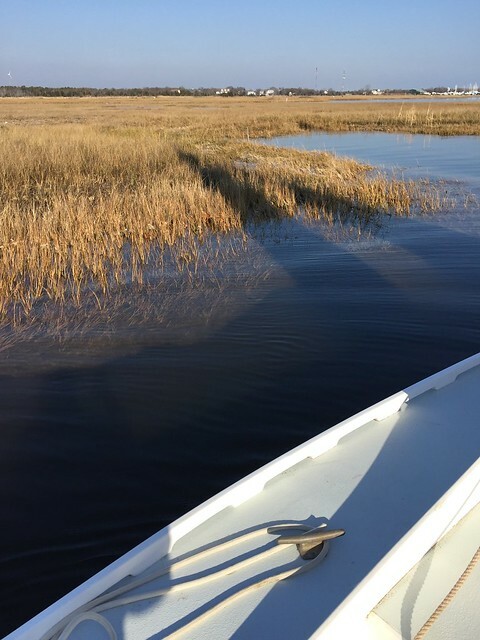 Here’s a new video of sailing along the all too near edge of the marsh on December 10th. Foggy morning in early December. No wind and little water. A watch below was called for. Your very happy and grateful Skipper. Well this has certainly been an eventful year with the return of Sjogin sailing in her home waters and her face all over the cover of WoodenBoat. Thanks all for following along and here’s our best wishes to you gentle reader for a fine New Year.